Email is a constant in our lives, yet it can be so overwhelming that it becomes almost 100% ineffective. I discussed with a friend the other day why they should switch from Yahoo to Gmail, and how to reduce the useless emails they receive. Below is how I suggested they move from one account to another, and how to leave all their crappy emails behind, and how to get to Inbox Zero. If you already use Gmail, save yourself some effort, and sign up for unroll.me, then read this article on managing important emails. If you don’t already use Gmail, why should you make the switch? Google calendar is extremely versatile. Y’all can each plan things, share calendars, and stay on the same page. Google Drive is a nice way to keep all your files in one place - you can use it on your phone, and do plenty of other things with it. You can sign into websites using your google accounts. You can set up a simple system to keep your email inbox to ZERO! (It is life changing. Seriously. That little article has changed everything about how I manage email. Day one: Sign up for unroll.me. You’ll unsubscribe from everything in your Yahoo account. Could be hundreds of subscriptions. It is life changing. Day two:Head over to gmail.com and sign up for an email account. Some variation of [email protected] is ideal, but I couldn’t get anything close to [email protected]. Day three: Time to clean out your Yahoo inbox. Gmail will automatically import all email in your inbox, so get rid of everything in your inbox that you don’t want to keep.I would temporarily move the last three weeks of emails in your inbox to a separate folder, then delete EVERYTHING else in your inbox. Day four:Follow these steps to import contacts to your gmail account, forward all new email, and get your basic settings tweaked in gmail. Day five: Sign up unroll.me for your new Gmail account. Email me when you’re done. Deleted thousands of emails, and unsubscribed from dozens of news letters. Started fresh with a new email account. 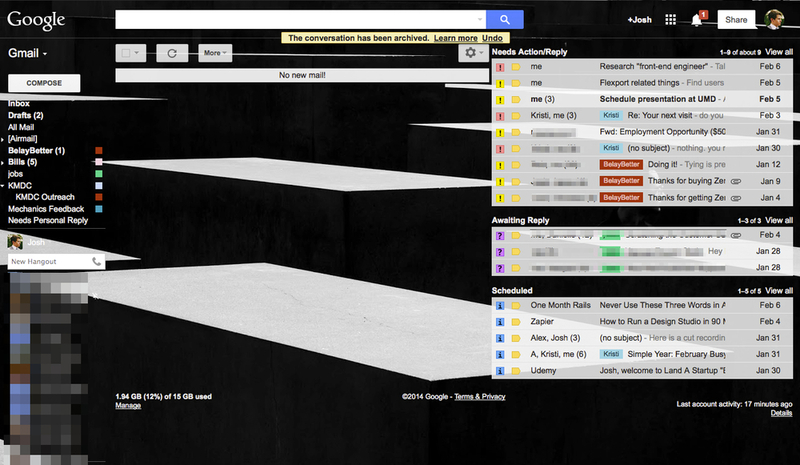 If you’re not controlling your inbox, it is controlling you.